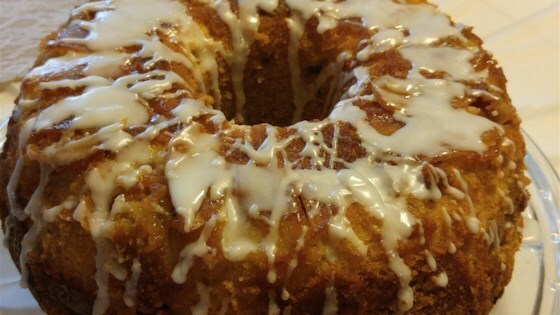 "There are very few Jewish Apple Cake recipes on Allrecipes, so after writing a review for the best one I could find and adding my own tips, I found that 111 people used them. So here is my version of the best Jewish Apple Cake out there (it was handed down to me by my grandmother). I've been making this cake for 37 years now. It is a foolproof recipe and a sure crowd-pleaser." Preheat an oven to 350 degrees F (175 degrees C). Grease and flour a 10 inch tube pan. Mix cinnamon, 3/4 cup of sugar, and apples in a bowl; set aside. Combine flour, salt, and baking powder in a bowl. Beat the eggs and 2 cups of sugar with an electric mixer until fluffy. Pour in the flour mixture alternately with the oil. Beat in the orange juice and vanilla until smooth and thoroughly mixed. Pour half of the batter into the prepared pan. Layer half of the apples on top. Pour the remaining batter over, then finish by topping with the rest of the apples. Bake in the preheated oven until a toothpick inserted into the center comes out clean, about 1 hour and 30 minutes to 1 hour and 45 minutes. Cool in the pans for 10 minutes before removing to cool completely on a wire rack. Use Granny Smith apples if you like it a little more tart. Drizzle the left over juice from the apple-cinnamon mixture over the cake for added sweetness and a light sheen. I did not care for this recipe. I thought it was heavy and too sweet. If you want the cake a little more moist, decrease flour by 1/4 cup. I use about 5-6 granny smith apples and it tasted great. This is my go to recipe during the fall and winter. I have known Janyce for over 10 years, her apple cake is the best! She broght it to work to rave reviews on several occasions-you go girl!